Discover Raiatea and its extensive marae Taputapuatea classified as a UNESCO World Heritage Site since July 2017, the Faaroa Valley and the river that runs through it to end with a swim in the lagoon of Raiatea. A busy half-day to discover the main sites of the island. Tahaa's coral garden is the most beautiful of all and houses thousands of colourful fishes, sea anemones, clams...etc. The underwater fauna is so rich, you will be surprised and amazed ! Swim with the low current to explore the coral garden and don't forget your waterproof camera to catch these beautiful colors ! 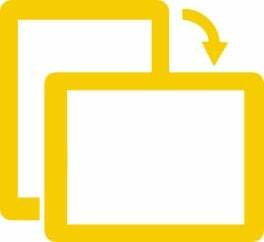 After a few minutes of explanation and an adaptation phase on the surface to familiarize with the equipment, the dive begin. 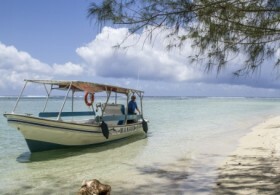 You will discover the lagoon for 45 minutes at a maximum depth of 6 meters. In these calm waters and without current, you'll meet most of the small Polynesian fishes: butterfly fish, clown fish or parrot fish, etc ... You will always be accompanied by an instructor who will guide you. 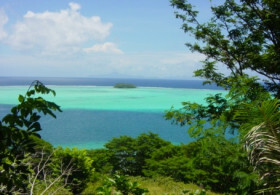 Enjoy a great day on the nearby island of Tahaa with the lagoon tour and many land and underwater discoveries! 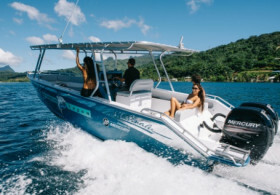 Embark on board a beautiful stable and comfortable boat with easy access to the water to enjoy more bathing. Lunch of local specialties is provided on a motu. 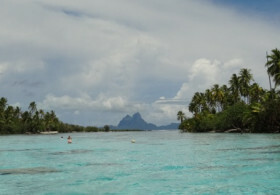 Enjoy a sun bath and a last swim before returning to Raiatea. 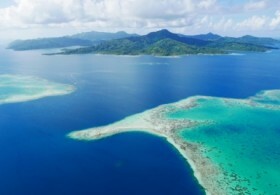 A must-do for all those who do not have the opportunity to stay on the island of Tahaa: the day trip to this island sharing the same lagoon as Raiatea ... Discover the most beautiful coral gardens in a crystal clear lagoon, the vanilla with this characteristic aroma and the Tahitian black pearl. Not to mention the delicious lunch on the motu before returning to Raiatea. Challenging hiking trail up the rocky Temehani Rahi plateau at the centre of the island. 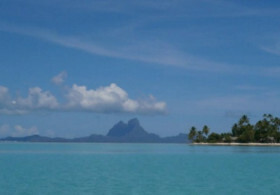 You will walk through a pine forest which opens onto a peak with endless views of the lagoon and neighbouring islands. You can swim in crystal clear waters, enjoy incredible views and above all see the famous flower "Tiare Apetahi" that only grows on Mt Temehani. 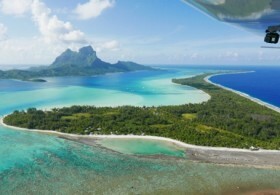 Embark aboard a Skylane 2-seat ultralight, also named the "little Cessna", specially designed to overfly landscapes, and enjoy the unique beauty of the Polynesian colors and sceneries. One passenger at a time, seated side by side with the pilot, panoramic view guaranteed, limited noise and no altitude restriction, the view is perfect down to the finest details! 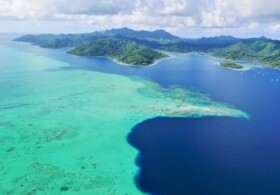 Discover the channel between Raiatea and Tahaa and the East coast of Raiatea to the extensive marae Taputapuatea. 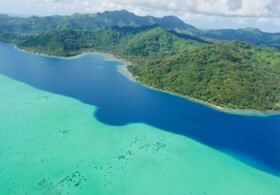 Enjoy the fairway between Raiatea and Tahaa, the magnificent shades of blue and turquoise of the lagoon. Moderate level hiking trail. 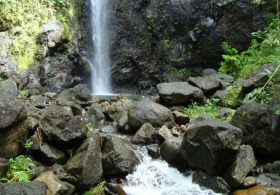 Visit the three waterfalls on Raiatea's island coast. Your hike begins in a forest bursting with "mape" (Polynesian chestnut trees) and bamboo and continues along the river which you will have to cross from time to time. Relax your weary legs in the cool pool at the bottom of the third waterfall. Discover the main interests of Raiatea's East coast by cruising on the Faaroa river among its tropical vegetation and visiting the impressive marae Taputapuatea. Your guide Suzanne accompagnied by boat captain Jean will lead you on Raiatea's lagoon towards Faaroa river, telling you legends on the river and the origins of the historic marae of Taputapuatea, the cradle of Polynesian culture and former seat of religious and political power of the whole country. 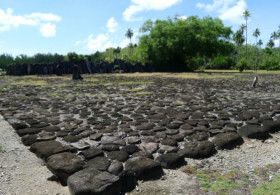 While staying in Raiatea, you cannot miss the visit of marae Taputapuatea located on the East coast of the island. 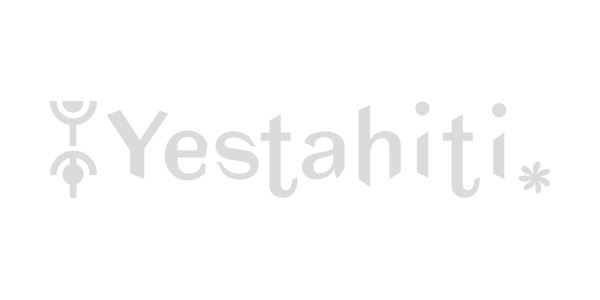 Named a World Heritage site since July 2017, this extensive archeologic former place of worship is a major site in Polynesian Culture. Enjoy the rest of the half day tour by also stopping at various view points. 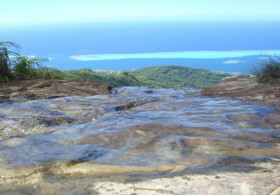 Challenging hiking trail up the rocky Temehani Rahi plateau at the centre of the island. 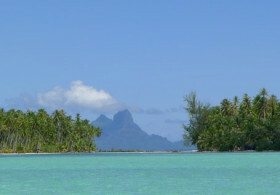 You will walk through a pine forest which opens onto a peak with endless views of the lagoon and neighbouring islands. You can swim in crystal clear waters and enjoy the incredible views. Bring at least 2 to 3L of water. 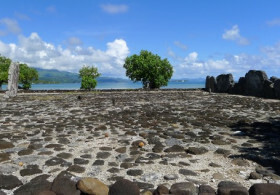 Raiatea is known for being the cradle of Polynesian culture as evidenced by the remains of the beautiful and extensive 2124ha marae Taputapuatea located on the seafront on the east coast of the island. Your guide will accompany you for a visit of this impressive former place of worships classified World Heritage by UNESCO since July 2017.